A single photo - no words - capturing a moment from the week. A simple, silly, out of the ordinary moment. A moment I want to pause, savor, remember, and never repeat. ...they ate all the clothes and left the hangers behind...?! Hi! I followed you here from soulemama. Your picture reminds me of our house. Our goats think they are a second set of dogs and always escape to try to come into our house! They are so cute. They fit right in to your household. Okay... but just so it's understood this is from the very same, small lapse in judgement I wrote about earlier! They do love escaping into the house... hahaha. Wish I could train them to help with the laundry... even stacking hangers! Isn't there an old song or nursery rhyme or something about a billy goat who ate someone's red flannel underwear? Not sure if it was on a hanger at the time... 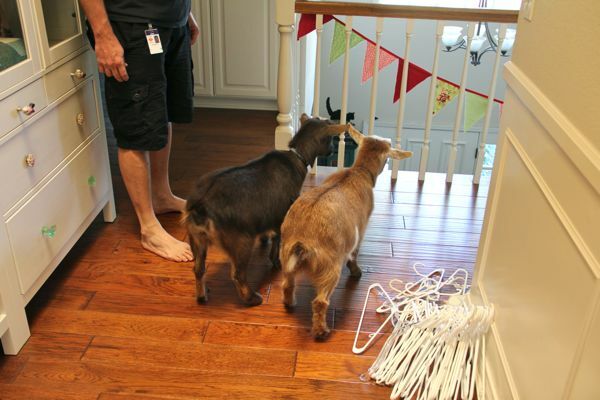 I can't tell you how tickled I am at the thought of goats in the house. Not practical, I know, and not a permanent thing, but thank you for making us all smile! LOL! I like how you changed the wording "silly" and "never" repeat. What a moment! Natalie, your hallway looks so homey. I love the colorful bunting you have strung up and the beautiful wooden floors and the fun knobs you have on that cabinet. I haven't been able to comment as much as I'd like lately, but I'm thinking of you and following along with the happenings over at the Bird House! I can imagine the clicking sound they make when they walk on the hardwood. Hysterical. Please comeback an write/ photograph soon, at home on bed rest for a week and without my chickens and goats I am crawling the walls. 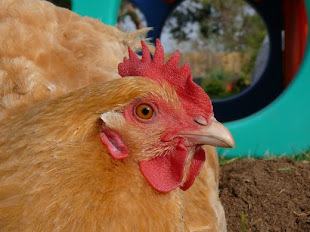 Between you and Hencam what else am I supposed to do!